Living in a chocolate factory is every kid’s, and some adult’s, dream. Just imagine the joy of turning your own kitchen into a small factory that is constantly churning out these tempting treats. 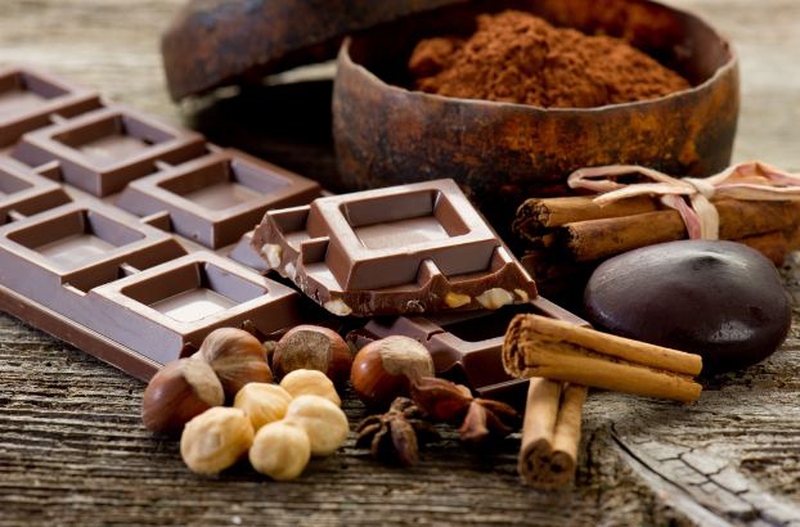 Now it is time to make that dream a reality, and this article will teach you how to make chocolate in few easy to follow steps. Whether you want to make some fancy chocolate bars or just want to enjoy a few blocks of sweetened chocolate, the main ingredients that you will need are basically the same. So make a short trip to the supermarket before you buckle up to work and gather these things: cocoa beans or cocoa powder, sugar, and cocoa butter. You can also opt for a blocks of unsweetened baking chocolate instead of cocoa beans and cocoa butter. Using them will let you skip the process of making your own chocolate base and just go straight to customizing your candy by adding different flavors. Note: Prepare butter and whole milk beforehand by taking them out of the refrigerator and letting them stand at room temperature. The butter must be softened enough for stirring before it can be used. Pour water into the heavy saucepan and heat until slightly simmering. Do not bring to complete boil. Mix the cocoa powder and butter into a chocolate paste. Stir slowly until the two ingredients are well blended. Pour the chocolate paste into the simmering water. Stir slowly to achieve a nice, smooth consistency. Bring the mixture to a simmer again. Remove from heat and pour into a large bowl. In a separate bowl, combine sugar, powdered sugar, and salt. Break any lumps that formed during storage and slowly stir with a spoon to mix them well. Add the combined sugar and salt to the diluted cocoa paste. Using a spatula or long handled spoon, stir the mixture slowly until you achieve an even consistency. Pour milk slowly and continue stirring. Clean and prepare the chocolate molds. Pour the mixture into the molds. Adjust the amount of chocolate mixture according to the desired thickness of the finished chocolate candies that you want. Store the molds in the refrigerator until the chocolates are hard enough to remove from the molds without breaking. The resulting homemade chocolate is softer than store bought chocolates. If you want to make them harder, just adjust the amount of water you use. You can also let the mixture simmer a little longer to let most of the water evaporate. Pouring thinner layer of chocolate mixture into the molds also results to firmer finished products. Another way to adjust to the texture of the chocolate is by using dairy butter instead of softened cocoa butter. What you have so far is, well, homemade chocolate – sweet and delicious yet ordinary. This is not good enough as an answer to how to make chocolate, especially so if you are planning to give them away to your kids or surprise your family with your new found chocolate making skills. So you have to bring your culinary works to another level. Improving the look and taste of your homemade chocolate candy may sound daunting, but it is actually rather easy. Just throw in a few of your kids’ favorite nuts into the mixture just before you pour them into the molds and you’ll have flavorful, crunchy chocolate bars that they will love to munch on. You can also use dark chocolates cut into small cubes to create a two-toned chocolate product. Or, you can adjust the amount of milk, sugar, or butter to improve the taste of the mixture. There is just so much that you can do to make your homemade chocolate taste and look better than store bought ones. There is actually an easier way to make chocolate at home if you don’t want to go through all the troubles of measuring and mixing cocoa powder, cocoa butter, and milk. Just head into the nearest supermarket and buy a few chocolate wafers. These are base chocolate bars that are specifically prepared for candy making. You can choose among dark colored ones, white, or chocolate white flavors. Using chocolate wafers is actually like cheating your way into the hearts of your kids. But they are handy when you need to whip up a few chocolate candies in a hurry and don’t have the time or the tools to do it. Just throw some of the wafers into the pan to melt them then pour the melted chocolate into the mold. Throw in some nuts and flavors into the mixture and you’ll be the proud chef of some colorful chocolate bars in just a few minutes. Tell no one that you cheated though. Serious kitchen warriors would not pass on the chance to really get their hands dirty (well, not literally) and experience how chocolate is made from scratch. Chocolate don’t grow on trees, you know. The old fashioned way of making chocolate involves selecting your own cocoa beans, roasting them, and grinding them to produce cocoa powder. After that, you need to carefully mix and cook them with sugar and butter. This process usually takes several hours to achieve the desired consistency and texture of the chocolate. Only then you can pour the mixture into the molds to cool them. Wait, you’re not done yet. What you’ve just made is non-flavored base chocolate. To get that delicious, melt-in-the-mouth sensation, you will need to melt the chocolate and start all over again, this time adding delicious flavors to the mix. Chocolate making is an art where your desire to learn and experiment is the only limit. Surprise your kids once in a while with these delicious prepared right in your kitchen. Better, ask them to help you for a superb family bonding. Or, if it is your kids that ask how to make chocolate in the first place, then it would also be a brilliant learning experience for them.